When you are looking for the absolute best Manakin Sabot tree removal service in the entire area, the only name you need to know is C.S. Flournoy. With over 30 years of professional experience in the industry, we are the Richmond tree removal company to trust for all of your tree removal, trimming, and stump grinding needs. We know exactly what it takes to get the job done, and get it done right the first time around. While other companies focus on getting the job done as quickly as possible so they can move on to the next, our team of experts strive to make sure that each job is performed to perfection, and that there are no minor details that fall through the cracks. We find that there is a certain truth to the mantra of measuring twice and cutting once. We never aim to just meet your expectations for our work, we are always focused on exceeding them. Making sure the trees on your property get the ongoing care they need is a more important aspect of being a property owner than most people realize. When you are looking to have this important job handled on your property, you want to make absolutely certain that you are getting the services of a qualified professional you can trust to do the job right. Here at C.S. Flournoy, we have worked tirelessly over the past several decades to establish ourselves in the local Manakin Sabot community as the best tree removal service you can find. Don't settle for sub-par service when the best is only a phone call away. If you have any questions about our full line of tree removal services or you would like to schedule an appointment for your consultation, give us a call today. 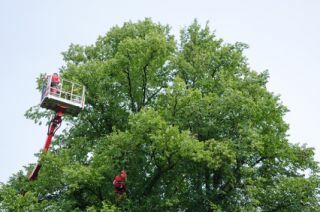 Our team of tree removal experts are always standing by and ready to assist you with all of your questions. We look forward to hearing from you. There are some situations that can arise that are going to require complete tree removal as opposed to just trimming it down. If you have a dead or dying tree in your yard, it might be best for us to go ahead and remove it before it has a chance to get blown down and cause severe damage to your home. On the other hand, maybe you have a tree that has grown a little too large and you can't help but think of how bad it would be for you and your family if it were to suddenly come down on your roof in the middle of a storm. Our team of professionals can help you with all of those issues and more. Large trees in particular can pose a significant risk to your home, not just because of the risk of falling and causing roof damage, but also because their expansive root systems can find their ways into your plumbing lines and septic systems, causing extremely expensive damages. They can also worm their way across your yard and damage you walkways, patios, pool areas, and even the foundation of your home. Don't take chances when it comes to large trees on your property, have a professional come out and assess the situation to help determine what should be done. Our team of stump grinding professionals at C.S. Flournoy are highly trained and knowledgeable. We only hire the most qualified professionals in the field, and every one of our technicians stays up to date on the best methods and products in our field so we can consistently deliver the best service. If you are looking for a Manakin Sabot Tree Removal Company then please call 804-264-1000 or complete our online request form.